Simplification of pension procedure **No. 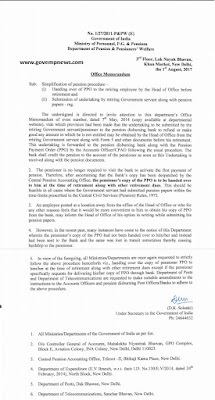 1/27/2011-P&PW (E), Government of India, Ministry of Personnel, P.G. 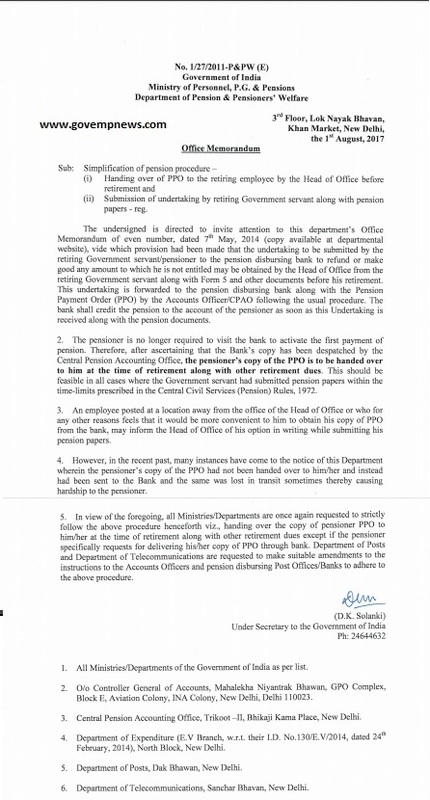 & Pensions, Department of Pension & Pensioners’ Welfare, 3rd Floor, Lok Nayak Bhavan, Khan Market, New Delhi, the 1st August, 2017** Office Memorandum ** Sub: Simplification of pension procedure ** (i) Handing over of PPO to the retiring employee by the Head of Office before retirement and ** (ii) Submission of undertaking by retiring Government servant along with pension papers - reg. ** pensioners is no longer required to visit the bank to activate the the first payment of pension. 1. All Ministries/Departments of the Government of India as per list. Block E, Aviation Colony, INA Colony, New Delhi, Delhi 110023. 3. Central Pension Accounting Office, Trikoot -Il, Bhikaji Kama Place, New Delhi. February, 2014), North Block, New Delhi. 5. Department of Posts, Dak Bhawan, New Delhi. 6. Department of Telecommunications, Sanchar Bhavan, New Delhi.